JR West resumed services between JR Shiraichi station and JR Mihara station on the Sanyo Main Line from 30th September 2018. This means that the train services between JR Mihara station and JR Saijo station are back to normal and become fully operable. JR West resumed services between JR Shiraichi station and JR Seno station on the Sanyo Main Line from 9th September 2018. This means that the train services between JR Hiroshima station and JR Saijo station are back to normal and become fully operable. The temporary train services between Shiraichi station and Hachihonmatsu station on the Sanyo Main Line ended on 8th September 2018. JR West resumed services between JR Kure station and JR Saka station on the Kure Line from 9th September 2018. The following additional Sanyo Shinkansen services between Hiroshima station and Higashi Hiroshima station ended on 8th September 2018 as JR West resumed services between JR Shiraichi station and JR Seno station on the Sanyo Main Line from 9th September 2018. This means that the Shinkansen services between the two stations are back to their regular timetable. Temporary Alternative Services by Sanyo Shinkansen between Mihara station and Hiroshima station ended on 8th September 2018. JR train services between JR Shiraichi station and JR Mihara station on the Sanyo Main Line are expected to start again sometime in October 2018. Special bus services between JR Saijo station and Sanyo Shinkansen’s Higashi Hiroshima station ended on 8th September 2018. As for the Information about Sanyo Shinkansen services after September 7th, it is to be announced shortly on the official website of West Japan Railway Company (JR West). Temporary bus services between JR Shiraichi station and Mihara station on the Sanyo Main Line, in which JR train services remain suspended, have been available since 21st August, 2018. The buses stop all the stations between JR Shiraichi station and Mihara station. * Train services between the two stations above are expected to start again from mid-October, 2018. JR West is going to resume services between Shiraichi station and Seno station on the Sanyo Main Line from 9th September 2018. This means that the train services between Hiroshima station and Saijo station are back to normal and become fully operable. The temporary train services between Shiraichi and Hachihonmatsu station on the Sanyo Main Line will end after 8th September 2018. Local bus services between JR Saijo station and Hiroshima University (Higashi-Hiroshima campus) are back to their regular services from today. Local bus services between Higashi-Hiroshima station (Sanyo Shinkansen line) and Hiroshima University Higashi-Hiroshima campus are back to their regular services (four inbound/outbound buses per day) from today. Local bus services between JR Hachihonmatsu station and Hiroshima University (Higashi-Hiroshima campus) have been resumed. As for the Information about Sanyo Shinkansen services from this September, it is to be announced shortly on the official website of West Japan Railway Company (JR West). Japan Railway (JR) Services: JR West has resumed services between Seno Station and Kaitaichi Station on the Sanyo Main Line. In addition, train services between Shiraichi and Hachihonmatsu station are expected to start again from 21st August 2018. JR West has resumed services between Seno and Kaitaichi Station on the Sanyo Main Line from 18th August 2018. In addition, JR West is going to start temporary train services between Shiraichi and Hachihonmatsu station on the Sanyo Main Line from 21st August 2018. Bus Services: Local bus services between JR Hachihonmatsu station and Hiroshima University (Higashi-Hiroshima campus) are to be resumed from 24th August 2018. Local bus services between JR Hachihonmatsu station and Hiroshima University (Higashi-Hiroshima campus) are to be resumed from 24th August 2018. Local Bus Services: Bus services between Hiroshima University (Higashi-Hiroshima campus) and JR Saijo station, and between Hiroshima University (Higashi-Hiroshima campus) and Higashi Hiroshima station, will go back to their regular services from 24th August 2018 onwards. Local bus services between JR Saijo station and Hiroshima University (Higashi-Hiroshima campus) will go back to their regular services from 24th August 2018 onwards. Local bus services between Higashi-Hiroshima station (Sanyo Shinkansen line) and Hiroshima University Higashi-Hiroshima campus are expected to go back to their regular services (four inbound/outbound buses per day) from 24th August 2018 onwards. Hiroshima University Open Campus will be held on Tuesday 21st and Wednesday 22nd of August. For the directions to Higashi-Hiroshima campus, please visit here. *Extra bus services will be arranged for these days in addition to the current services on the Temporary Timetable. Details on the extra bus services are available here. Additional bus services are arranged between Friday 10th August 2018 and Thursday 23rd August 2018. As for the Timetable, please click the pdf file below. *As for the bus services on the days of “Hiroshima University Open Campus 2018,” i.e. on Tuesday 21st August 2018 and Wednesday 22nd August 2018, extra bus services will be arranged for these days in addition to the current services on the Temporary Timetable. Details on the extra bus services will become available soon. Bus services between Higashi-Hiroshima station and Higashi-Hiroshima campus of HU are expected to be back to their Regular Timetable (four inbound/outbound buses per day) from Friday 24th August 2018 onwards. If you need to get to Hiroshima University during these days, you are advised to use the bus services available between Higashi Hiroshima Station and JR Saijo Station. Once you get to JR Saijo Station, please use the bus services between JR Saijo Station and Hiroshima University. *You can use your PASPY card for the payment. * If you are the holder of the season ticket/commuter pass (tsuugaku-teiki in Japanese) between JR Saijo Station and Hiroshima University, you cannot use the pass for the bus ride between Higashi Hiroshima Station and Hiroshima University. This means that you have to pay separate bus fare for each ride between Higashi Hiroshima and Hiroshima University. *Please refer to the official website of the West Japan Railway Company for the latest information about its service operations. *As for the latest information about highway and local bus services, please visit the official website of the bus company in question. After Friday 10th August 2018, there will no longer be any chartered bus services between Kure and Higashi-Hiroshima campus of HU. *Extra bus services will be arranged for these days in addition to the current services on the Temporary Timetable. Details on the extra bus services will become available soon. 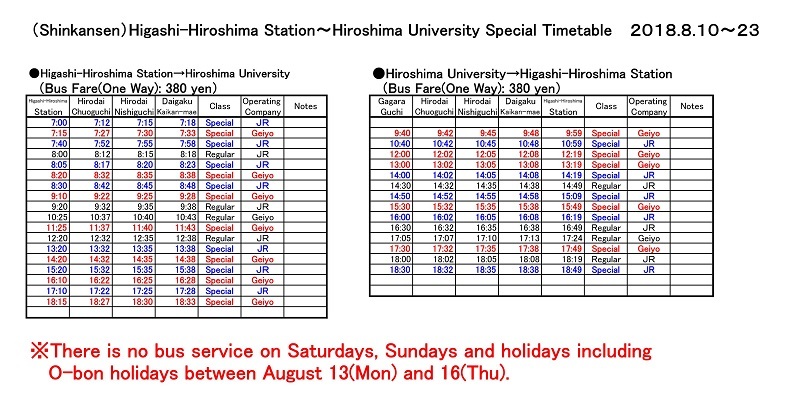 Hiroshima University provides chartered bus services between JR Hiroshima station and Hiroshima University Higashi-Hiroshima campus on August 4th and August 5th, in which exams will be held. Please note that the services are available for HU students, faculty and administrative members only. *Please note that the chartered buses offer non-stop service between JR Hiroshima station and HU Higashi-Hiroshima campus. 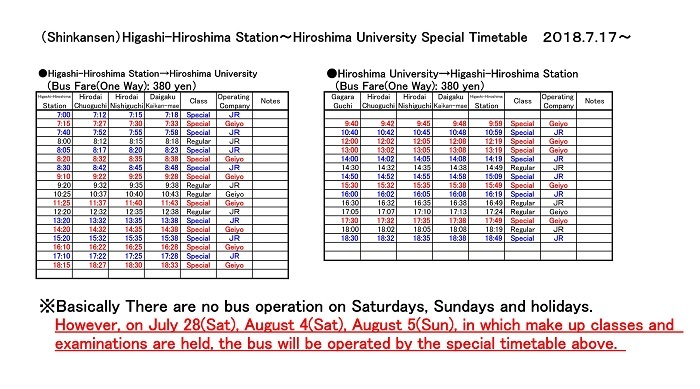 Highway bus services between Hiroshima University Higashi-Hiroshima Campus (known as Green Phoenix) are available on August 4th and 5th on the basis of the weekend time table. Highway Bus "Green Phoenix" resumes its services between Hiroshima University and Hiroshima Bus Center from July 15th, even all the buses go via Saijo IC. From August 1st, the bus services are back to normal; some buses returned the normal routes via Shiwa IC. As all the classes are starting from 17th July 2018, additional bus services have been arranged between Higashi Hiroshima Station and Hiroshima University on weekdays. On the follwing dates in which the make up classes and exams will be held, bus services are available: Saturday 28th July 2018, Saturday 4th August 2018, and Sunday 5th August 2018. As for the time table, please see the pdf file below. You can use your PASPY card for the payment. If you are the holder of the season ticket/commuter pass (tsuugaku-teiki in Japanese) between JR Saijo Station and Hiroshima University, you cannot use the pass for the bus ride between Higashi Hiroshima Station and Hiroshima University. This means that you have to pay separate bus fare for each ride between Higashi Hiroshima and Hiroshima University. Bus services on Saturdays, Sundays and National Holidays: no bus service is available between Higashi Hiroshima Station and Hiroshima University except on the following dates: Saturday 28th July 2018, Saturday 4th August 2018, and Sunday 5th August 2018. If you need to get to Hiroshima University during these days, you are advised to use the bus services available between Higashi Hiroshima Station and JR Saijo Station. Once you get to JR Saijo Station, please use the bus services between JR Saijo Station and Hiroshima University, which are provided on the basis of the weekend time table. Click the timetable to view the full size PDF. Hiroshima University provides chartered bus services between Kure and Higashi-Hiroshima campus on weekdays during July 17th to August 9th. The bus services are available on the following dates as well: Saturday 28th July 2018, Saturday 4th August 2018, and Sunday 5th August 2018, in which the make up classes and exams will be held. Please note that the services are available for HU students, faculty and administrative members only. The National Highway Route 2 reopened throughout Hiroshima prefecture on July 21. JR Express Bus resumes its services (known as “Green Phoenix”) between Hiroshima University and Hiroshima Bus Center from July 15th. Please note that all the buses go via Saijo IC. Airport Limousine services between Hiroshima Airport and JR Saijo station are back to normal from July 15th. As all the classes are starting from 17th July 2018, additional bus services have been arranged between Higashi Hiroshima Station and Hiroshima University. As for the time table, please see the pdf file below. ※ If you are the holder of the season ticket/commuter pass (tsuugaku-teiki in Japanese) between JR Saijo Station and Hiroshima University, you cannot use the pass for the bus ride between Higashi Hiroshima Station and Hiroshima University. This means that you have to pay separate bus fare for each ride between Higashi Hiroshima and Hiroshima University. 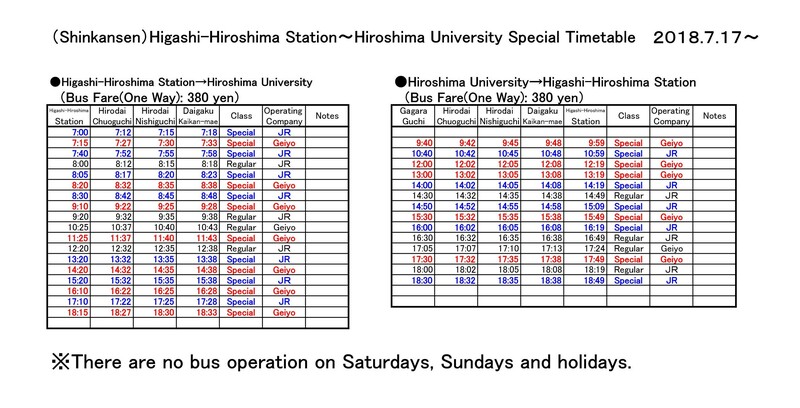 ※Bus services on Saturdays, Sundays and National Holidays: no bus service is available between Higashi Hiroshima Station and Hiroshima University. If you need to get to Hiroshima University during these days, you are advised to use the bus services available between Higashi Hiroshima Station and JR Saijo Station. Once you get to JR Saijo Station, please use the bus services between JR Saijo Station and Hiroshima University, which are provided on the basis of the weekend time table. Negotiations with the local bus companies are under way for our request of the bus services which are needed for the classes/examinations at the university on the following dates: Saturday 28th July 2018, Saturday 4th August 2018, and Sunday 5th August 2018. We will let you know once the decision has been made. At 6 am on Saturday July 14th, the stretch of Sanyo Expressway between Hiroshima IC and Kouchi IC reopened, marking the end of blockage on the entire stretch of Sanyo Expressway. On the same day, the blockage between Umaki IC and Hiroshima Higashi IC on Hiroshima Expressway No. 1 Route, connecting to Sanyo Expressway, has been lifted. Following the lift up of the blockage on Sanyo Expressway, Airport Limousine starts running between Hiroshima city and Hiroshima Airport from July 14th. Following this, temporary bus services between Hiroshima Airport and JR Higashi-Hiroshima station will end on July 14th after the last bus leaves from each bus terminal on that day. Bus services between Hiroshima Airport and JR Saijo station as well as between Hiroshima Airport and JR Shiraichi station, still remain suspended. Apart from the above, there has not been any update. Local bus services between Hiroshima University (Higashi-Hiroshima campus) and JR Saijo station via the Boulevard have been resumed, even though the buses run on the weekend timetable. Bus services between Hiroshima University and JR Saijo Station via Shitami area and those between Hiroshima University and JR Hachihonmatsu station still remain suspended. Other transport information remains the same as given below. Sanyo Expressway has been reopened between Hongo IC and Kouchi IC. According to NEXCO (West Nippon Expressway Company Limited), the expressway between Kouchi IC and Hiroshima IC is expected to reopen in about a week (It is currently restricted to emergency vehicles and relief supply vehicles only). The public highway from Hiroshima is available via Hiroshima Kumano Road, Higashi-hiroshima Bypass and Saijo Bypass, both along the National Highway Route 2 but heavy congestion is expected. Higashihiroshima-Kure Expressway has been reopened. Other transportation information remains the same as of July 9. Sanyo Shinkansen is operated as usual. Bus services between Higashi-hiroshima station and Hiroshima University are back to normal from July 9th. Japan Railway San-yo Line is suspended between Itozaki station and Kaita-ichi station. Bus services from Hiroshima University to JR Saijo station and Hachihonmatsu station are both suspended. Most of flights from and to Hiroshima Airport are operated normally. To access Hiroshima University, taxis and temporary buses are available between Hiroshima Airport and Higashi-hiroshima station. The public highway from Hiroshima is available via Hiroshima Kumano Road or National Highway Higashi-hiroshima Route 2, but heavy congestion is expected.